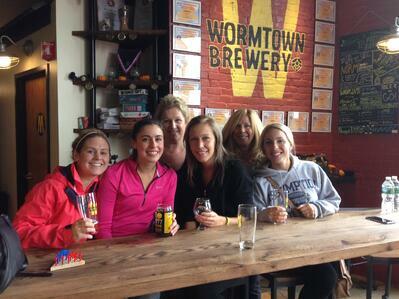 Special events are a great way to invite women into your taproom space by appealing to a topic or activity of interest and coupling that with a beer tasting. Events have become a huge trend in the beer, wine and spirits industry and can really set your taproom apart in attracting a whole new type of clientele. Special events such as --hosting a catered brunch with beer tasting, a yoga and brew fitness series, or a paint night and brews party-- encourages new clients to come in to check out your space and try your brews while enjoying an activity that they may already love. Beer is great thing to bond over! Create a speed-dating event where customers are able to come to the taproom to experience a flight while doing speed dating at the same time. For established couples or those seeking a more private experience, offer a tasting sampler paired with some chocolates from a local purveyor. Your couples will have fun feeding each other chocolate and pairing them with your beer. Reach out to your local community women’s outreach organizations, professional women’s associations or local small businesses (think boutiques, women’s gyms, or jewelry stores) and invite them to use your space to host their next event. You can provide the beer and they can provide the speakers or networking group. This provides a great opportunity to bring women into your taproom and invite them to try out your brews. A good old fashioned ladies night (or day) where specials, discounts or incentives are offered for women customers is a great way to entice customers to come in for a beer solo or with a group of friends or family. Partner with a local restaurant or chef in your community to offer a specialty cooking class with a menu that pairs well with your beer offerings. Your foodie customers will love learning something new, getting hands on with the food and pairing their creations with your brews. This is a great one for a date night theme as well! Logistical details matter as well. You can host a dynamite event but if you have insufficient or unsafe facilities, that can put a huge damper on the vibe and can leave customers hesitant. Ensure your atmosphere is relaxing and welcoming for all customers. Be sure to provide clean and accessible bathrooms, comfortable seating, a knowledgeable and friendly taproom staff and music and decor that appeals to a wide variety of tastes and preferences. Parking areas should be well lit, accessible and well maintained. We hope you’ll experiment with some of these tips as you think about how to set your taproom apart and create that inviting and positive, memorable taproom experience for your customers. If you found this article helpful please share!